Are you a fan of Signed, Sealed, Delivered? Recently, stars Kristin Booth and Crystal Lowe spoke with the La Crosse Tribune about the future of the Hallmark Channel franchise. From Martha Williamson, the TV movie franchise began as a show in 2014 and follows four postal workers who find the recipients of undelivered mail. 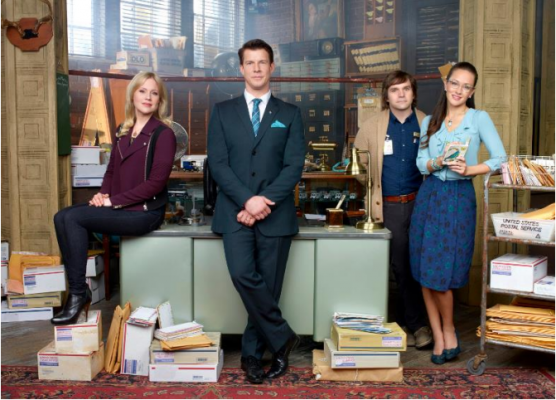 The cast includes Eric Mabius, Kristin Booth, Crystal Lowe, and Geoff Gustafson. The most recent Signed, Sealed, Delivered movie, To the Altar, premiered on Hallmark Channel on July 15th. What do you think? Do you watch the Signed, Sealed, Delivered movies? Who’s your favorite character? Please bring it back. Love this show. I love the POstsbles! I didn’t see the original series, but caught up when the episodes were all aired in a marathon before the premiere of the first movie. I’ve only missed one movie so far, but it taught me to keep checking Hallmark’s schedule. I hope they continue to make these for a long time. Today the first episode or movie was on. Shayne begins her job at the dead letter office. I really enjoy the whole cast. Keep them coming. Love the show! So much Love and fun! Bring it back. One of the BEST was the Hurricane looking for the musician! Yes I have watched all of shows since the beginning over and over again. Hard to say which is my favorite person because they are all so unique. It is just such a wonderful wholesome show. Please don’t stop, we need this in our world today. No favorites – love them all. Can’t wait for the next move. How about 4 each year? Waiting with bated breath for the last 4 movies to come out on DVD. Don’t have cable and really like this series. Love this series, very heartwarming, funny and in the end always enlightening. Hope the series gies on for a long time. All the characters are good, no one real favorite, they each bring a different talent to the acreen. Hope to see another marriage, some children maybe a love interest for Olivers father. Wonderfully well written. I adore Signed, Sealed, Delivered! The stories are wonderful!! They make me laugh and cry and sometimes keep me on the edge of my seat hoping that they will find who they are looking for to deliver their mail. The cast is outstanding! I love them all, but Norman is my favorite. He makes the best faces in the world. I pray that Hallmark continues this series of movies for a long time!!! Love this series. I’ve watched it from its inception and sincerely hope it continues. Movies like this are rare. They make my heart sing. Been a fan since the first series and look forward any new movie. I hope they continue!